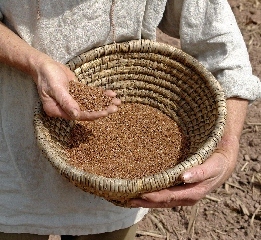 Flax was one of the earliest cultivated crops. The original wild version may have come from the Middle East, though it was also found in Europe. More than 10,000 years ago in the Swiss Lake region, for example, the entire green stalk was used for making baskets, much like rye straw baskets today. In fact, "flax" means to plait or braid to make baskets.Over winter, the stalks would rot and the long fibers that keep the plant upright would be freed from the stalk and could easily be twisted between the fingers into thread for sewing hides together into primitive clothing. Sowing flax seed. Flax typically requires about two bushels per acre with soil that has been well limed and manured. Flax is typically sown early enough in a season to get a head start on weeds. Flax in bloom at the Hermitage with seed pods forming. Flax seed in a rye straw basket ready for broadcasting. Pictures are from our new book, “The Big Book of Flax” published by Schiffer. Christian pulling flax at the Hermitage. Flax is typically harvested when the lower third of the plant turns yellow and the leaves start to drop off. A large handful of flax plants are tied with a special “flax knot” that is easy to untie. Thirty to 40 bundles are stood up to make a shock that typically takes a week for the water weight to dry and the seeds to harden. Pulling flax straw through the rippling comb separates the seed pods from the straw. The pods can then be threshed and the seed saved for the next season. Surplus seed was traditionally pressed for linseed oil, used in Colonial times for paint, printing ink, as a lamp fuel for lighting, for cooking and it had medicinal properties. Right, retting or rotting the flax by laying it back on the field, a process called dew retting and gives the flax a silver color. This was typically done in America by German settlers. This process can take three to six weeks. Submerging the flax under water, in a pond, canal or stream, gives the flax a beautiful golden color but also causes pollution problems and has been banned for large-scale commercial growers by the European Union. Our turkeys looking for grubs and worms among the dew-retting flax. Christian checks flax retting in the pond, truly low-scale production.